found in the PREPRODUCTION folder. Isaac has been committed to foam. I would like to say that it went smoothly but unfortunately that was not the case. As I stated before, foam rubber is a very strange animal. Isaac is much smaller than the Dead Thing so the batch size was smaller but other than that, the conditions where identical to the previous foam run. And yet, the results where not a complete success. That's not to say it was a disaster or a right off. Let me explain. The front of the puppet is perfect but the back of the head and part of the characters shoulders contained several air pockets. When I foam up a puppet, I always brush an initial coat of rubber into the mould to make sure it gets into all the details. I then pour in a large quantity of foam and spread it out evenly before placing the skeleton in the mould. Finally, I spoon extra foam over the skeleton before closing up the mould. In this particular case, all of the detail was there but because of the air cavities, the foam rubber layer was very thin. 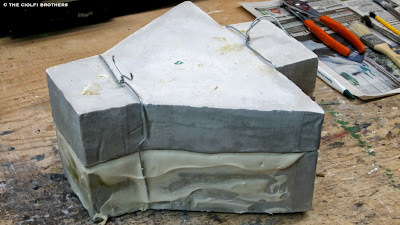 I initially tried to fill the air cavities with liquid rubber but I did not like the results so I decided to make a couple of liquid rubber patches directly from the mould and glue them over the damaged areas. This procedure turned out to be very effective and negated the need for a second run. I am making a back up/stunt version of Isaac with a basic wire armature in the coming days so I will be curious to see how that one comes out.